I’ve been blogging for about two and a half years now and I always try to keep my blog and blogging life as organized as I can, but sometimes it’s just a LOT to take in all at once. I’m always a big fan of Bloggiesta and using that time to get more organized but depending on what weekends it falls on, I can’t always participate due to my schedule and I have SO many things that I need to work on that I just can’t quite do it all in one weekend. So the more I thought about it, the more I thought it would work well for a six month-long challenge! To just say “get more organized in 2015” is still pretty overwhelming. I’m sure a lot of us want to work on some specific things but if you’re anything like me, you’ll start to work on updating reviews then somehow end up working on Goodreads and then before you know it, you’re just rearranging your books on your bookcase again which is not even what you meant to do. (Trust me. This has happened MANY times.) Instead of just saying, “Pledge to organize more in 2015”, I wanted to break it down month-by-month and even week-by-week if you so desire! There’s a lot to try to cover regarding “blog maintenance” and to focus on a year even seems overwhelming so I thought six months would be nice! Each month in the challenge will have a different focus with the last month revisiting everything you’ve done so far in the year. EDITED 12/16: The more I thought about this challenge and how different it will be for everyone, the more I just want to throw in my two cents here for everyone looking to get organized this year — take it from someone who loves to stick their hand into way too many cookie jars — Being organized is NOT about planning every single thing. Being organized is about having a game plan, trying to stay ahead or things (or catch up on things) but NOT overscheduling yourself or stressing yourself out! There are too many times I (for example) tried to plan out my exact TBR or gave myself a strict reading schedule and that not only didn’t work and made me feel like I “failed” but it also discouraged me in many ways. So yes, getting organized does require a little extra work, but it should really be more about figuring the ways you can set yourself up for success and not about scheduling every single little thing. Capisce? Let’s kick it off with January so you can get a feel for the challenge! Research which 2015 challenges you’d like to take part in. See below for some ones that I’ve found and if you know of any more, leave them in the comments! Pick a few specific books to read each month. I know some people mood readers and can’t PLAN which books to read (totally me) but last year I picked a few ARCs that I wanted to read in a specific month (or books for other challenges/read alongs, etc) and then I was able to read them within that month but any time I was in the mood for them instead of “read by X” date (which usually made me NOT want to read them). Make a list and pin it up somewhere you’ll see pretty often (fridge, office, wall, etc) so it won’t fall by the wayside. Make a Goodreads shelf! Have some books you know you want to read in 2015? Make a list on Goodreads (or a physical list) with new or older reads that you want to read this year. Work better with motivation? Find a blog maintenance buddy & work on things at the same time! Need someone to help you through some reads? Been meaning to read some big books but are intimidated by them? Grab a friend to do an informal read along! Make plans to read and write! Are you someone like me who has a limited amount of time to read or write? Try to pick a day/time to work on blog things or to read. Make a plan so your parents/sig other/friends will know you’re busy and you can schedule around it. Many others listed at You, Me, and a Cup of Tea and a Pinterest board from The Book Vixen! I put rules in quotes because really, there are no “rules” to follow. This is titled as a challenge, but it’s more of a way to consistently keep organized. The guidelines are simply this: follow the month’s theme and work on what you can. Not everyone will need each bullet point. Some people will think of more things to add under the theme. (Leave a comment if you think of some so I can update the post!) Work on anything related within the given month. There is no “failing” in this challenge. If you’ve done anything to work on your blog, you’re a success! The Blog Organization Challenge will run from January 1st to June 30th. If all goes well, we’ll start all over in July (blog maintenance is constant!) and even add more things to work on because I know I won’t think of everything as we go along. Participants can join in at any time! It’s never too late to join. I have a linky for sign-ups below (no sign-up post is required but feel free to spread the word that you’re joining in!) and do whatever you can each month. Everyone is bound to have a busier day/week/month so just do what you can when you can! And don’t forget to grab the button! Feel free to make your own “mini-challenges”! I won’t be officially hosting any mini-challenges but if you have a discussion, how-to, or mini-challenge (past, present, or future), send me the link and I’ll include it in appropriate month’s post! Want to chat about it on social media? Use the hashtag #BlogOrganization! Find a buddy, grab some ideas, get motivation, ask questions… Sky’s the limit! Want to see what the upcoming months have in store? Here’s a general outline of what we’ll be focusing on each month! MAY: Book clean-up + spring cleaning! 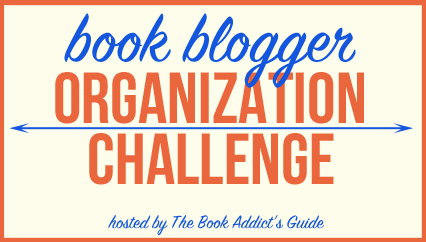 Hope you’ll join me for the Book Blogger Organization Challenge! If you have any 2015 Challenge links, ideas for blog maintenance, previous organization posts/mini-challenges, or anything else you may deem appropriate for this challenge, please message me or leave them in the comments! Bloggiesta Mini-Challenge: How to Make Goodreads Work For YOU! Reading Resolutions: 2014 Top Ten Tuesday – January 8, 2013: Top Ten Bookish Goals For 2013 Book Blogger Appreciation Week 2012: Interview Swap! This entry was posted in Blog Event, Books and tagged 2015, 2015 Challenge, Blogging, Book Blogger Organization Challenge, Books, Challenge, Organization on December 8, 2014 by Brittany. Such a cool idea! I’m a go with the flow kind of blogger and tend to fly by the seat of my pants. It’s not often I schedule posts, but I do like to try and keep organised. Even if that never really goes to plan… I’m still deciding on which challenges I might take part in, but I’ll definitely keep this in mind. As for 2015 challenges, I may or may not be organising something… 🙂 Good luck with the challenge and I hope it goes well for you to host it all year round! Thanks, Rebecca! I know, I usually fly by the seat of my pants too… and somehow I never get things done! Haha. Thanks for keeping this in mind! 😀 If you do join in, I hope it helps!!! I love this idea. I need help being organized but I’m so intimidated by the idea. I dropped challenges long ago because I felt they added stress to an already chaotic life. I’m going to keep this in mind and see if it could help jolt me into actually doing something about my unorganized blogging life. I love the idea of organization! But I’ll often make a plan and then . . . just never follow through with it. Something that has really helped me is to have a planner. I’ve used online calendars, but those never worked for me. So I actually have a paper planner, and although I do use it somewhat to stay on top of what I’m posting when, I also use it to make to-do lists and that has helped me soooo much! I really like you sixth month challenge! Being organized makes you feel so much better. Oh, this is SUCH a good challenge! 🙂 I’m definitely jumping on board with this one! I signed up for a few reading challenges last year and found it hard to stick to them, so for 2015 I think I’m going to maybe pick one reading challenge and stick to it. At the moment I really like like the sound of the re-read challenge as there are so many books (particularly books I read as a child/teen) that I would love to go back to again. OMG, where have you been all my life? YES YES YES!!! This sounds great! I’m a new book blogger, so any help I can get with organization will be lovely! Also, will you delete #11 from the linky list? The link is broken and it doesn’t go to my blog. Oh YAY thanks for joining in! I really hope the challenge helps!!! Alright…. I love this…. and as much as I struggle to stick with challenges or tbr lists… i’m REALLY going to try to do this, even if i follow it loosely. I think it’ll really help! We are moving next week… hopefully by early january we’ll start to feel settled in… perfect time to freshen up my blog routine! Not sure yet if I will be joining, but I wanted to say I really like this idea and how you have a specific focus for each month. February and March have some topics I really should be doing, like the cleaning up of old layouts and cleanign up my social media accounts and who I follow. I started changing my old review banners to the new one, but eventually stopped. I love this, but also, I NEED this haha! I will probably jump in in February and try to follow along as best as I can! This is such a good idea so thank you for hosting this! This is such an awesome challenge!!! As a newer blogger I could really use this. As a high school student my organization is crazy right now. I could really use a buddy to help motivate me! Anyone else in need? OH YAY! Welcome to the book blogging world 😀 Do you have a Twitter account? I can spread the word and see if someone needs a buddy! Yeah I do! @fly2daMax Thank you so much! Love it!!! I always feel so unorganized so this is perfect. 🙂 My intro post will go live on Dec. 19. Thanks for hosting!!! Thanks, Meghann! Looking forward to your intro post! So glad you could join in!!! OH YAY! I signed up for the re-read challenge too. It looks like a lot of fun!! This is a really great idea! I’ve really wanted to organize my blog, update it, add more content, etc for quite a while. This past year was so busy for me since I got married too! But I’m really going to try to stick to a schedule a little more. I’m really bad at picking too many challenges, hosting too many tours and agreeing to review too many books. I just need to take a step back and remember why I started blogging in the first place – I just love to read and share my thoughts about the books I’ve read! 🙂 Great idea and can’t wait to participate! Thanks for organizing this event. I’m a new blogger, and I’m looking forward to learning so much more from this experience! I’m back again! Just wanted to say thanks for adding Dive Into Diversity to the list 🙂 So many tempting challenges to join next year! I think this is a fabulous idea and just what I need! I look forward to getting organized with all y’all! Amazing idea!! I’m signing in absolutely! I love that you’re doing this — I just wrote up my blog resolutions for 2015 and being more organized was one of them! This is the perfect challenge to keep my “in line” and organized in the new year. This challenge will whip me right into shape. I’m glad to participate! I need this soooo badly! I love this! I was a terrible blogger the last two years… first I was working a bunch of PT jobs while going to grad school, and then I was frantically applying for ALL THE JOBS. In my spare time I was just to burnt out to consistently dedicate time to the blog. But! I’m finished with school, and I got a full time job in October, so things are starting to settle down. I think a challenge like this is just what I need to dive back into blogging and make some good habits right at the start of the year! What a neat idea! I’m actually working this year to organize our home and make life less chaotic for our family…..so perfect to also work to get my blog up and running in an organized fashion. 🙂 Love it! I am so grateful for this challenge even if I am a bit late with signing up for it. If I’m more organized then maybe I’ll actually remember to keep everything moving and up to date. Now just to find some creative ideas for the later months for me to make everything look new and exciting. This is the year I vowed to take my blog from a fun, do it when the mood hits kind of blog to one that totally rocks. I am fully engaged in taking my blog to the next level. This challenge feels like it was made with me in mind. So yes! I am so in! Thanks for sharing Create With Joy! I started the year with the best intentions and now I know I have over committed and am struggling for balance. This is an awesome challenge and I am having so much fun with it. I would like to share a helpful tool that I used when learning to read css/html… her name is Ro Little. She is a blog designer who has created a series of videos to help you with your blog or even making a blog. It is called How to design a Blog. She walks you through everything with simple and easy steps. Using both Blogger and WordPress, she will help you understand the world of css and html. She helped me out so much I actually bought a membership even through most of her videos are free and setting up a blog is all explained. I recommend her to every blogger, weather it is book blogging, movie blogging, video gaming, fashion, whatever. just check her out. Just thought all would appreciated the suggestion. And come visit my site for other helpful tools, tips, and tricks. Topian Books. Late in joining, but I have been doing this since January as I am a new blogger and have all to do!!!!! Look forward to joining again in July! Trust me to find this fantastic challenge just before it finishes 🙁 Will be subscribing so if you start this up again I can join in 🙂 This is like an extended #Bloggiesta, love it!